As one of the country’s largest manufacturer of pre-engineered and custom-engineered overhead crane solutions, Uesco Cranes builds several different configurations of the single girder crane variety to fit various applications or environments. 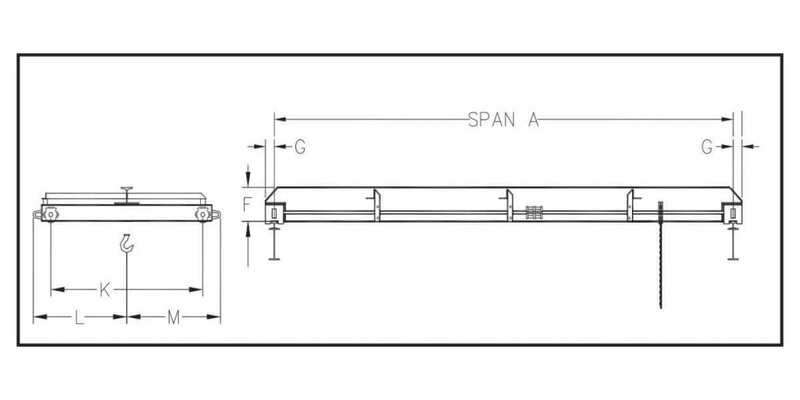 The single girder, under running, hand geared crane line of products features capacities from 2 tons to 10 tons. This line of cranes does not require electrification, and it is ideal for applications requiring accurate load spotting, spark resistance, where electric motors are not required, or where electricity may not be readily available. The trolleys for hand-geared cranes use a looped hand chain which is attached to a hand chain wheel or sprocket. When the operator pulls the hand chain, the gears are engaged moving the trolley wheels. Each of these cranes have 5″ diameter machined steel wheels with a crowned or flat tread for operation on a standard S-beam, wide flange beam, or patented track. You may use a variety of hoist types, but frequently hand chain hoists and lever chain hoists are preferred options with this type of crane. Built of structural steel girders, which meet or exceed CMAA design specifications plus OSHA and ANSI standards, all of our overhead crane solutions have a minimum deflection of 1/600 with a built-in safety factor of 5 to 1. All Uesco overhead cranes are rated for a minimum CMAA Class C service. Spans up to 30′ in length are standard. We also custom fabricate runways in different configurations depending on your company’s requirements. Rubber bumpers and rail sweeps are standard on all cranes. All of our cranes, end trucks, and runway systems are made in the U.S.A.
To request a quote, use the button below to download a fillable PDF. Complete the forms, and then contact us using the link located at the bottom of this page to upload your PDF to us. DIM. D: 11" 11" 11" 13" 15" 15" 17"
K: 4'-6" 4'-6" 4'-6" 4'-6" 4'-6" 5'-6" 5'-6"
L: 3'-1" 3'-1" 3'-1" 3'-1" 3'-1" 3'-6" 3'-6"
M: 3'-1" 3'-1" 3'-1" 3'-1" 3'-1" 3'-6" 3'-6"
DIM. D: 13" 13" 13" 15" 17" 17" 17"
K: 4'-6" 4'-6" 4'-6" 4'-6" 4'-6" 6'-3" 6'-3"
L: 3'-2" 3'-2" 3'-2" 3'-2" 3'-2" 4'-0" 4'-0"
M: 3'-2" 3'-2" 3'-2" 3'-2" 3'-2" 4'-0" 4'-0"
DIM. D: 17" 19" 19" 22" 22" 28" 28"
L: 3'-3" 3'-3" 3'-3" 3'-3" 3'-3" 4'-1" 4'-1"
M: 3'-3" 3'-3" 3'-3" 3'-3" 3'-3" 4'-1" 4'-1"
DIM. D: 19" 22" 22" 22" 25" 25" 25"
Please consult the factory or your local Uesco distributor with all the requirements of your application. Watch "Building the Perfect Crane" Now!